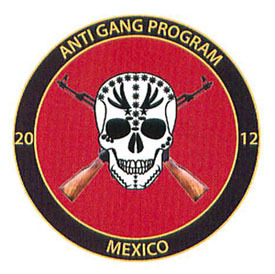 The seal of the 2012 “Anti Gang Program” for Mexico adorns most of the pages of this strange document. Written in Spanish, the document appears to have been produced by an unspecified U.S. law enforcement agency and bears the markings of the 2012 “Anti Gang Program” for Mexico. Stranger still, INM published the document without further explanation on a lonely, uncategorized outpost of its Web site that is essentially unreachable unless you perform a Google search for the document title: “Pandillas Latinas y Los Tatuajes del Pandillero” (“Latin Gangs and the Tattoos of Gang Members”). The document is especially interesting in light of a 2012 Wall Street Journal report that gang tattoos are preventing some would-be immigrants from obtaining visas and green cards. “Tattoo checks have ensnared scores of immigrants—mostly from Latin America—even though they have no criminal conviction,” according to the report. Read the full post and view pages from the report at Migration Declassified.